Rajon Rondo won an NBA title with the Boston Celtics in 2008 and was a four-time All-Star with them. On Thursday night, Rondo returned to Boston as a member of the Los Angeles Lakers, and played the villain. With the Lakers trailing 128-127 in the final seconds, a loose ball found Rondo and he nailed a jumper to give Los Angeles a dramatic road victory. The story of the game was the Lakers’ shooting from behind the arc, where they made a franchise record 22 three-pointers on 41 attempts (53.7%). The Lakers, who stocked up on 3-point shooting at the trade deadline, came out and set an all-time franchise record for 3s made in a game tonight with 22, while they're waiting on Reggie Bullock's and Mike Muscala's arrivals. It's been a wacky season in Laker Land, folks. 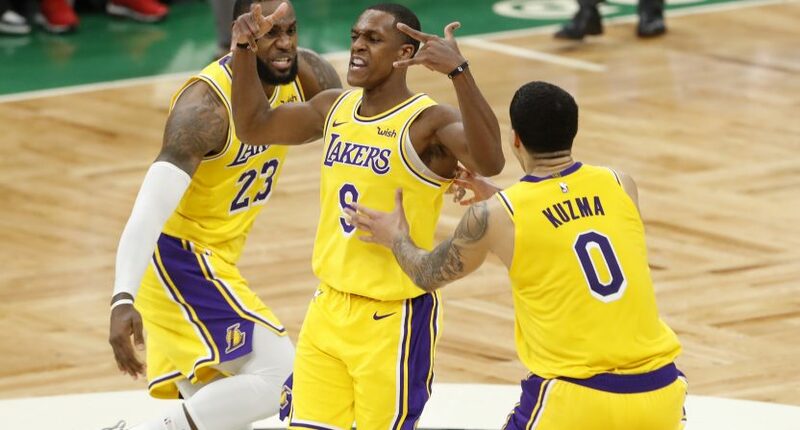 Rondo had three of those three-pointers, while LeBron James, Kyle Kuzma, and Kentavious Caldwell-Pope all drained five triples. #LeBronJames saves it.#LeBronJames drills it. This was a surprising victory for the Lakers (entered as 9-point underdogs) and a much-needed one. Los Angeles suffered a brutal 42-point loss to the Indiana Pacers on Tuesday and entered play on Thursday two games back for the West’s No. 8 seed. It will be interesting to see if this victory gets the Lakers going, but they face another very difficult test in their next game on Sunday in Philadelphia against the now-loaded 76ers.